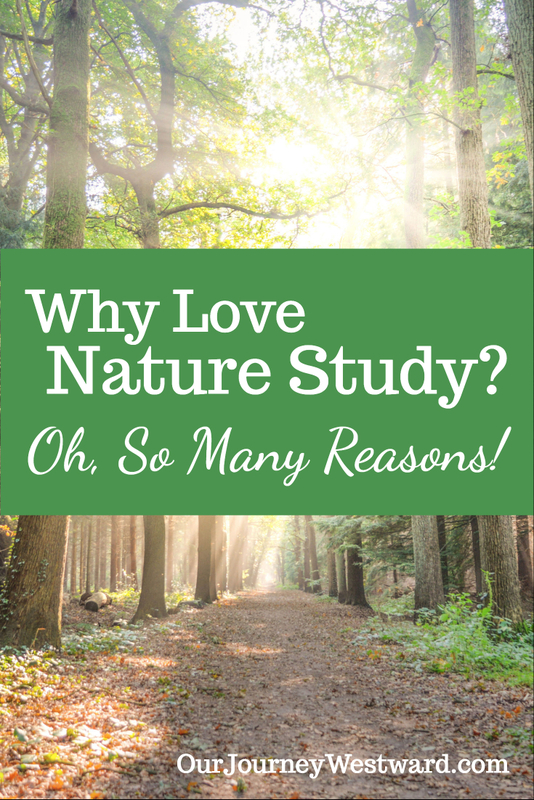 Why Love Nature Study? Oh, So Many Reasons! 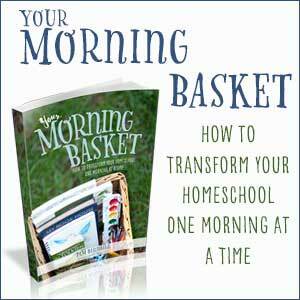 Welcome to Day 7 of the 10 Days of Homeschooling blog hop! 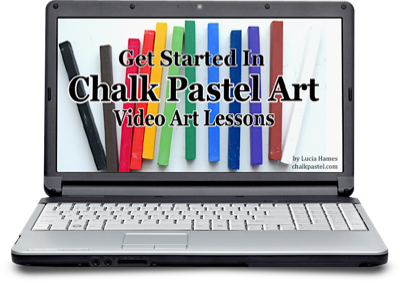 You can find the previous posts on my Charlotte Mason Series here. I’ve been so excited to write about nature study because it’s become such a rich, exciting time of learning for our family! I’ve been a nature lover from the time I was a child, but had no idea how much something as fun as nature study could reach so deeply into every single realm of science. Nor did I realize that God would reveal Himself to my family in such a powerful way as we find Him during nature walks. Can you tell I’m pretty passionate about nature study? Early on, I used to be a CM homeschooler who added nature study to the schedule when and if we had time. It was an extra, a luxury of sorts, that came after the “real” lessons. 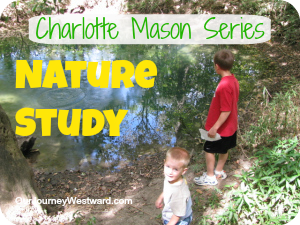 Several years ago, I challenged myself to incorporate nature study weekly since it was such an important part of a Charlotte Mason education. Boy, was I surprised to find our scheduled afternoon of nature study became the most anticipated activity of the week! Enough rambling. 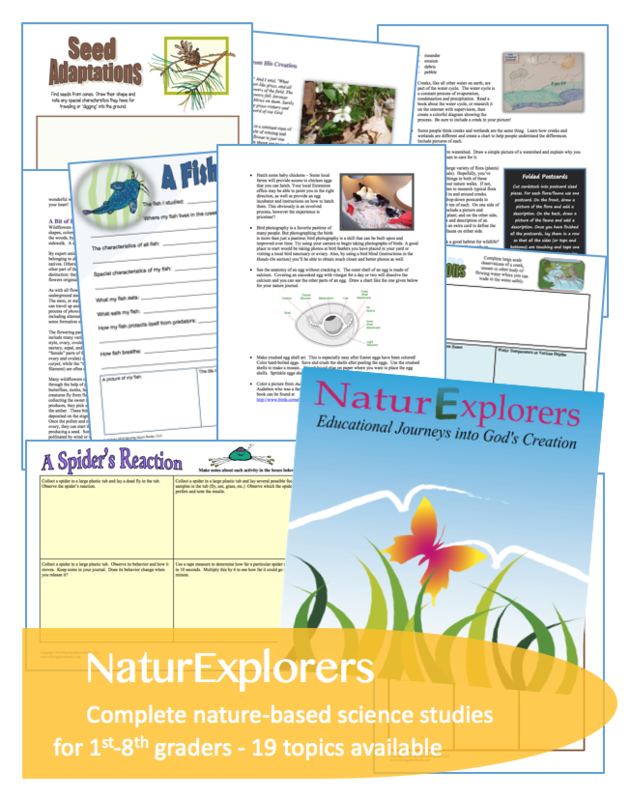 Below is an introduction to nature study that I’ve included in several workshops I’ve taught and a few of my NaturExplorers publications. It’s lengthy, but explains nature study more concisely than my rambling! God teaches us through nature and helps us to grow closer to Him. It involves most of the sciences and opens the door to other academic areas. 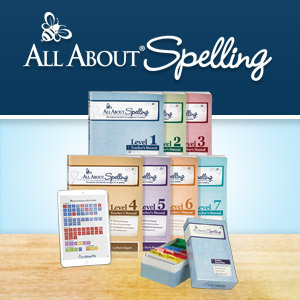 It stimulates excitement about learning, curiosity, discrimination/comparison skills, memorization, research and more. It allows for family time, fresh air, sunshine and exercise. c. The questioning should be very relaxed and gentle. It shouldn’t be turned into a “lesson”, nor should it be regurgitated later for another parent. The parent should be genuinely excited to learn about the child’s observations. The parent should refrain from talking too much. Regular written documentation is encouraged in the form of a diary, drawings, notes, pressings, calendars and more. Describing and/or noting correct names and parts should be encouraged, within reason considering the child’s age. My overall philosophy when asked how to study nature is, “Any way you like!” or “Whatever works for your children!” The most important thing, in my opinion, is that your children are immersed in and overjoyed with God’s creation. This is why the NaturExplorers studies I co-write offer so many ideas. Some children love to draw and document in journals, others enjoy scavenger hunts, and still others enjoy on the spot experiments and observations. Simple walks with no planned purpose in mind. Take along a blank nature notebook and sketch or write about whatever strikes a fancy. Walks with a purpose in mind. Take along specific field guides, notebooking pages or nature bag materials that will enhance the learning about the particular topic. 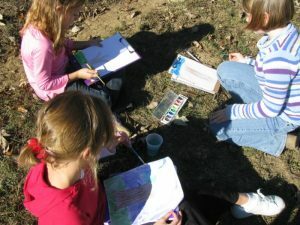 Nature projects are walks that go a step further to include experiments, comparisons, collections, maps, graphs, writing, storytelling, art, crafting, planting, etc. Seasonal unit studies allow you to take one nature topic and focus on various aspects about it over the course of a month, a season or longer. 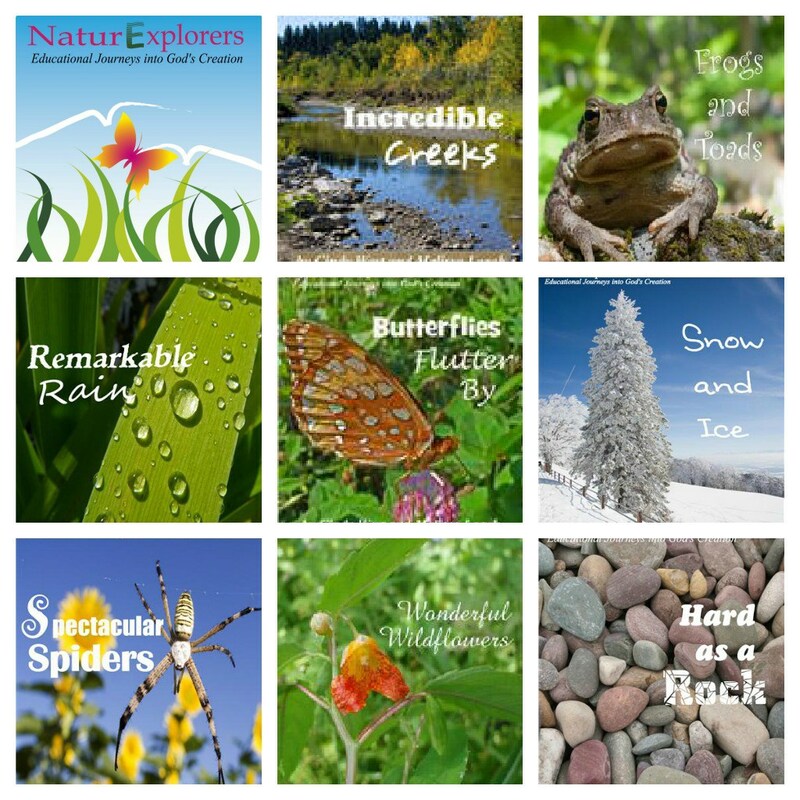 I would love for you to check out the NaturExplorers studies. 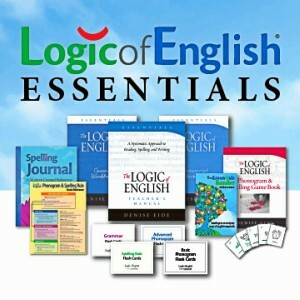 We have 19 different topics available! Join our Facebook page to keep up-to-date on specials and giveaways. Also, please come back tomorrow as we discuss Handicrafts and Life Skills! I love CM and have fell short of the nature study part, which is such an integral part of her method. For children to truly fall in love with God…they need to be in ‘awe’ of him….and what better way than through his creation! Thank you for this! Thank you so much for sharing about CM with all of us!! I am have been reading and learning more about her methods over the last year and love everything that I have read. You posts have been a great help in helping me to see how her methods practically play out. We will defiantly be moving more in this direction as we continue to homeschool. You’re so right…nature study is so important for our kids. We’ve lived in the suburbs, the country and the city and though one can see nature in all places the country has been the most cherished time for my kids. 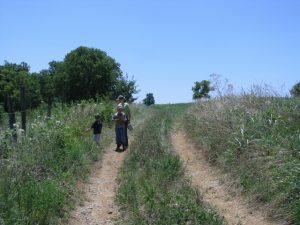 I would encourage every homeschooling mom (and dad) to continue nature study. Even if its just pointing out simple things, no matter where you are. I have to admit that even though I am surrounded by 10,000 acres readily accessable for us to explore, I haven’t been doing a nature study every week. In fact, I’m lucky if we do it once a month. I have made every excuse – it’s too cold, too many snakes, fear of mountain lions (no, I’m not joking) it’s too windy…. but your post has inspired me to get my act together and get back out there! 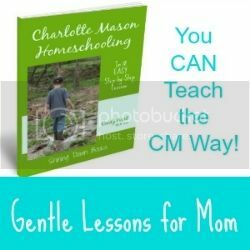 I’m new to homeschooling and the Charlotte Mason method. I’m excited about both! The aspect of nature studies are especially appealing to me and I’m sure will be to my children as well. Thank you for your wonderful and informing posts. Nature is a favorite in our house. At some point I was getting disappointed that we can’t go not a nice park or lake or something like that. I soon learned that there is so much to see just around our neighborhood. Ants and squirrels, dogs and cats, clouds and sun, all get a different look through children’s eyes. I’ve had my eyes on your Incredible Creek study for a while now. My boys love to play in the creek. I love when we can get outside and explore. It makes learning so much more fun! What an inspirating post. I have been ditching nature study for most of the school year, but you have inspired me to bring it back. Thanks for all your wonderful posts. I’ve gone to your book website, but I was still wondering what you think is the appropriate age for your nature studies? Thanks for asking. 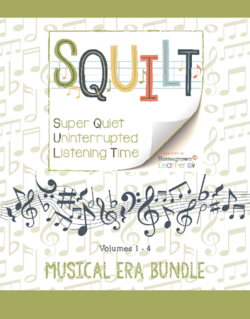 They are written with the 1st-8th grader in mind, but we offer additional ideas in each unit for preschoolers as well as high school students. This is great information. I love taking my boys out in to nature. The most fun I had was last fall on quite a few occasions we went “urban foraging” and it was great to show my boys how food is growing in nature all around us! I love the CM approach but I have been so bad about the nature study part of it. Like you said I just seem to put that to the side if we have time, which rarely seems to happen. I would love to get back to it again! I miss nature study, we have veered away from this winter. But looking forward to restarting in a couple of weeks. Please enter me in the giveaway. Would love to win the living math or nature study book. Yes, even city-dwellers can do nature study regularly! Lots of people skip nature study because they don’t want to take the time to drive somewhere exciting. Thank you for mentioning that nature is exciting no matter where you go! Yep, it often will never happen without purposeful planning. Like we train habits into our children, once we begin regular nature study, it becomes part of our week naturally. That is one thing that I love about the CM method is nature study. I have a daughter who will start preschool this fall and I’m trying to figure out how I’m going to do everything that I want. I am planning on doing nature studies! So many things we’ve learned have been been “on the spot” and from play time outside! !